Changes to human foods, animal foods, produce safety and foreign supplier verification program. Standards for the Growing, Harvesting, Packing, and Holding of Produce for Human Consumption (“Produce Safety proposed rule”). The amended proposed rules are the result of FDA rethinking its approach after receiving over 20,000 comments from interested parties. 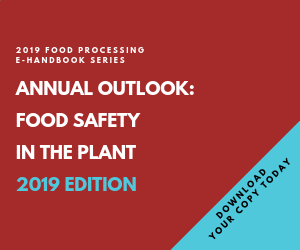 The HARPC proposed rule, along with FSMA section 103, generally requires the operator of a food facility to prepare a written plan to (1) evaluate the hazards that could affect food manufactured, processed, packed, or held by the facility; (2) identify and implement preventive controls; (3) monitor the performance of those controls; (4) develop corrective actions if preventative controls are not effective; and (5) verify that preventative controls are effective. Eric Lindstrom is counsel with law firm Keller and Heckman LLP. Contact him at 415-948-2811 or lindstrom@khlaw.com. FDA’s amendments to the proposed rule include, among others, changes to the definition of “farm” to include the packing and holding of raw agricultural commodities, regardless of where grown; changing the term “hazard reasonably likely to occur” (a term from FDA’s HACCP rules) and replacing it with the term “significant hazard,” which would mean a “known or reasonably foreseeable hazard” (also a defined term) for which a person knowledgeable about the safe manufacturing, processing, packing, or holding of food would, after a hazard analysis, establish controls to minimize or prevent the hazard in a food; clarifying the process for withdrawing qualified exemptions from food facilities; adding provisions for product testing, environmental monitoring, supplier controls and economic adulteration; and defining “very small business” – a status which delays the date to comply with the rule – to be a firm having less than $1 million in total annual sales of human food. The Animal HARPC proposed rule is also based on FSMA section 103 and is intended to impose the same basic controls on the manufacturing, processing, packing or holding of animal food. FDA’s amendments to the proposed rule are also very similar to those for human food and include clarifying the process for withdrawing from food facilities qualified exemptions and adding provisions regarding product testing, environmental monitoring, supplier controls and economic adulteration. FDA also proposes that the definition of “very small business” would be a firm having less than $2.5 million in total annual sales of animal food and revises current Good Manufacturing Practices (cGMPs), which are designed to establish standards for producing safe animal food, be more applicable to the animal food industry, and provide flexibility for the wide variety of animal food facilities. The FSVP proposed rule is based on FSMA section 301, which requires each importer to perform “risk-based foreign supplier verification activities” in order to verify that the food imported is (1) in compliance with HARPC or the Produce Safety rule, as appropriate, and (2) is not adulterated or misbranded under the Food, Drug and Cosmetic Act. FDA’s proposed amendment calls for a more comprehensive evaluation of potential risks by expanding the factors that must be considered when determining the compliance status of each imported food and supplier, as well as the hazards in each food. FDA’s proposed amendment also would require the importer, based on the risk evaluation the importer conducts, to determine and document what supplier verification activities are appropriate for a particular food and foreign supplier, as well as the frequency with which those activities should be conducted. The Produce Safety proposed rule is designed to minimize the risk of serious adverse health consequences or death from consumption of contaminated produce through the establishment of science-based minimum standards for the safe growing, harvesting, packing and holding of produce for human consumption. Those minimum standards include proposed regulations regarding exemption of certain farms, training of personnel, quality of agricultural water, soil amendments, animals, equipment, buildings and recordkeeping, among others. FDA’s amendments to the proposed rule include changes to, among others, water quality standards and testing frequencies that should reduce the burdens on farms; farm size thresholds that will cause more farms to be excluded from application of the proposed rule; and an increase in the number of activities in which a farm can engage without being considered a “mixed-type facility,” allowing more farms to avoid regulation under the HARPC rule. FDA is accepting comments on the specific proposed amendments until Dec. 15 Comments on other provisions of the proposed rules will not be accepted. New poultry inspections from USDA, more finalization of FSMA from FDA. A fairly new requirement of the 2011 FSMA requires food facility registrations by this Dec. 31.